The Cayman Aggressor V is a 120ft (36m) motor yacht which cruises at around the best dive sites of the Cayman Islands. There are many opportunities during the trip for snorkeling and island visits. 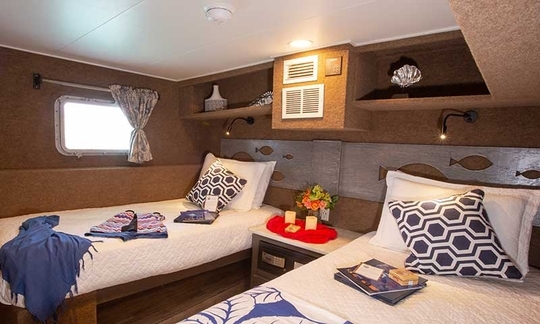 This steel-hulled Cayman Islands liveaboard accommodates a maximum of 20 guests in comfort and style. 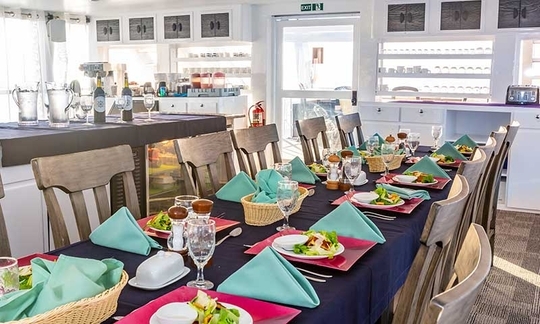 The spacious air conditioned lounge, complete with full entertainment system, and the dedicated dining room are the main social focal points on board. However you can also relax on the sun deck which comes complete with sun chairs and sun loungers, a hot tub, a music system, shaded wet bar and grill. 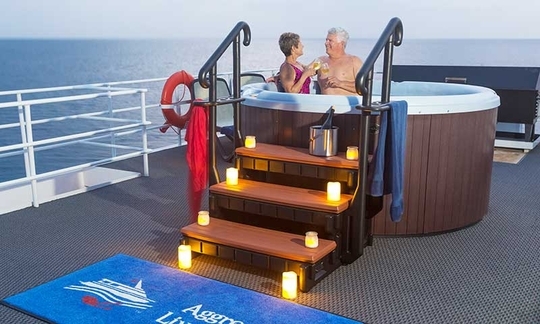 A further relaxation spot on the Cayman Aggressor V is the covered cocktail deck on the upper deck. 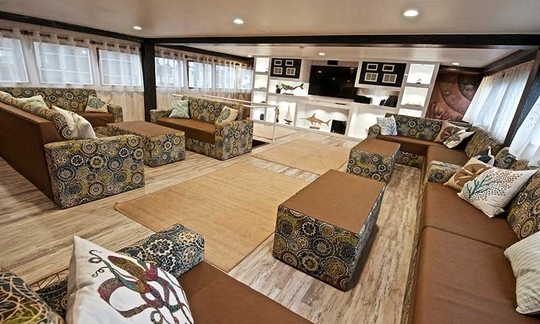 There is no shortage of comfortable hang-out spaces on this liveaboard. There is satellite email and phone available for guest use where necessary although no internet browsing facility. 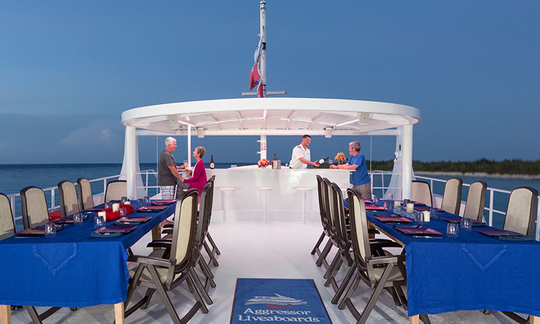 You can enjoy the assortment of music and movies on board as well as shore excursions to cays and beaches. All cabins have a TV with movies selection, some cabins have private balconies and there is even a morning beverage service: coffee delivered to your cabin door! 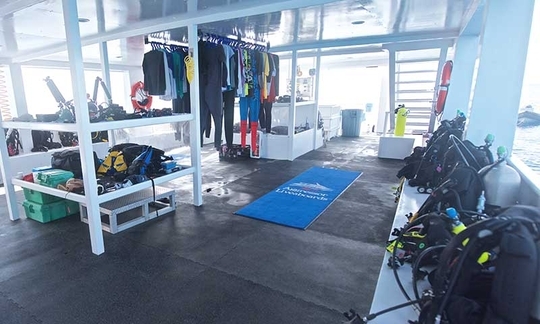 Diving facilities include nitrox, camera table with low pressure hoses, 2 hot fresh water showers on the dive deck, and individual guest storage spaces. All dives are made from the ship's platform at the stern with exit ladders for exiting the water. Meals are buffet style except for dinner which, like all Aggressor liveaboards, features waiter service and complimentary local beer and wine. Occasionally meals may be served al fresco on the sundeck. As with all Aggressors, you are free to dine in an on-shore location of your own choice on the final evening. You can expect American-style food as well as local dishes. Keeping you well-fed and entertained, both above and below the water, the Cayman Aggressor V delivers a very comfortable, high quality Caribbean liveaboard adventure. 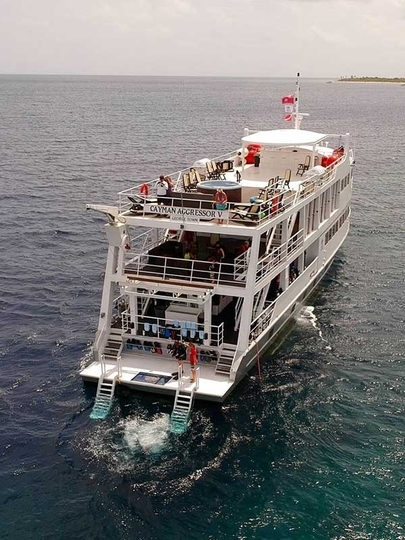 Cruise price per person includes: Cabin accommodation, breakfast, lunch, dinner, snacks, drinking water, soft drinks, hot drinks, local beer and wine, dives (as detailed in the safaris above), experienced English-speaking divemaster(s), tanks, weights and weightbelts. 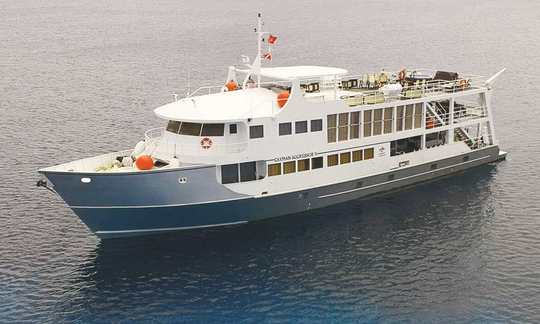 Cruise price per person excludes (mandatory, unless customer provides own): Restaurant meal on final evening, scuba equipment rental: 7 nights - US$ 175, diving computer, dive insurance (see our insurance program for a competitive quotation), port and park fees (2019: 7 nights - US$ 95 per person per charter). Unless otherwise stated, all the listed items need to be paid on arrival (cash or credit card). 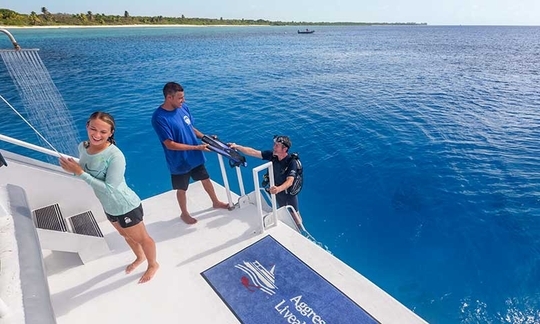 Optional extras: Transfers to the boat from the airport/hotel/port, alcoholic drinks, nitrox fills for enriched air certified divers: 7 nights - US$ 100 per person, torches. Unless otherwise stated, all the listed items need to be paid on arrival. How to get there: The Cayman Islands are a British crown colony located in the western Caribbean some 480 miles (770 km) south of Miami. Map of the Caribbean Sea . Grand Cayman enjoys many direct flights from the US plus many connecting flights from Canada and the UK. The main airlines are British Airways, Cayman Airways, US, Spirit, Delta, Air Jamaica, Continental and American. Arrival/Boarding/Departure: You should aim to arrive on Saturday at Grand Cayman International Airport where you will be met by a uniformed crew member. Since it is forbidden by local law to transfer guests, you will be assisted in arranging a taxi to the dock where you can board any time after 15:00 hrs. Local taxi laws mean the airport transfers are excluded from the package. The Cayman Aggressor V departs early Sunday morning returning to George Town Government dock after lunch Friday afternoon. There is a 18:00 hrs cocktail party on Friday evening with check-out at 8:00 hrs Saturday morning. The last dive of the trip will be at around 12.00 noon on the second last day of the trip. Please wait at least 18 hours before flying after diving. Diving Environment: You will, weather permitting, explore the walls and ship wrecks of Grand Cayman, Little Cayman and Cayman Brac. All diving is conducted from the mothership. In the warm clear water you will dive walls, reef and wrecks surrounded by stingrays, lobsters, tarpon, sharks (including Caribbean reef sharks), turtles and schools of silversides. There are also lots of fun smaller creatures like the mesmerizing Caribbean reef squid. You will need little more (and some prefer less) than a 3 mm full length wetsuit. The water temperature averages 78-82°F / 25-28°C. Non-diver rate: US$ 200 off the full published price. 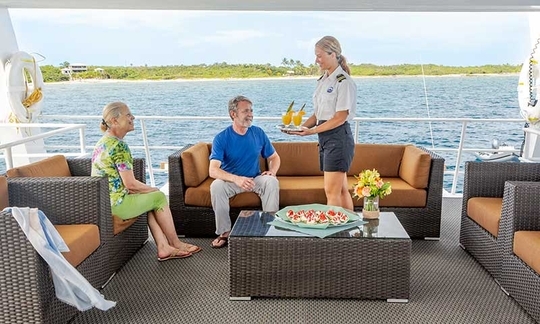 Dive clubs and group discounts: Pay for 9 guests and 1 additional person can join the cruise in a Twin Stateroom free of charge (total 10 or more guests). Pay for 18 guests and 2 additional people can join the cruise in a Twin Stateroom free of charge (total 20 guests). Whole boat charter rate (per night): US$ 7 959 per night. 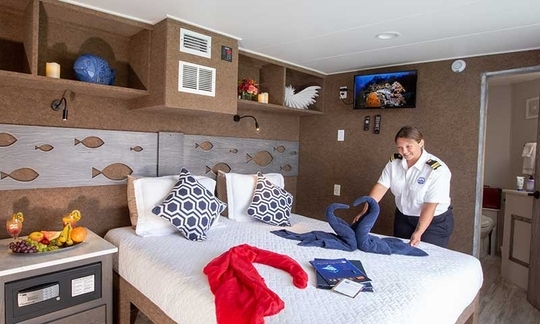 There are 10 staterooms on board the Cayman Aggressor V. There are 2 Balcony Suites on the main deck featuring a king bed (or 2 twin beds), floor to ceiling windows and a private balcony. 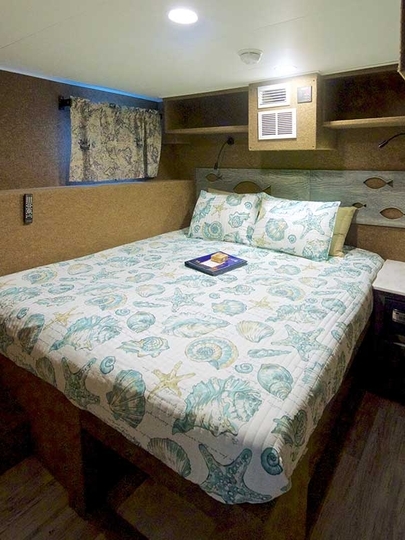 All other cabins are on the lower deck: 5 Deluxe Staterooms with a king bed (or 2 twin beds) and 3 Twin Staterooms (2 single beds, side by side). 2 of the Twin staterooms (numbers 1 and 2 near the bow) have no portholes.